This is the story of the good clown gone bad. Guaranteed to instill a touch of coulrophobia (fear of clowns) in your audience. The fun and innovative interweaving of musical styles and concepts evokes feelings of the classic circus and dream like nature of children while, at the same time, music is slowly and cleverly evolving and developing by manifesting these carnival and circus like atmospheres and melodies in to becoming nightmarishly evil, twisted, eerie, and maniacal images of the evil killer clown. Not only visually inspiring, by playing on the inherent creepiness of clowns, but also full of essential technical, effectual and virtuosic moments. These clowns are grotesque parodies of their big-top cousins, hiding hideous malformed teeth behind terrifying circus makeup. 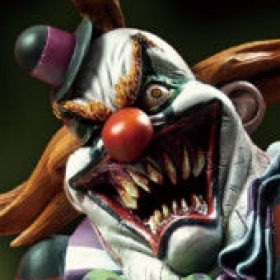 "Attack of the Killer Clowns" will definitely add a fun and gruesomely stylish touch to your percussion program.